The 24th of February. So far, the bees seemed to have wintered well. Today they were actively flying and foraging, collecting pollen, which can be seen as coloured lumps on their back legs. Yellow pollen is possibly from willow trees and brown is likely to be from gorse. 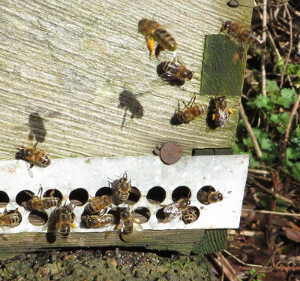 To see such a level of activity so early in the season is a good sign for beekeeping year ahead. But, the days following the 24th have been less good and the bees less active. Bees will ‘boom’ when the weather is good and barely survive if it’s cold and wet so beekeeping is an extremely weather dependent occupation. We’ll see what the next few months brings and post updates here.